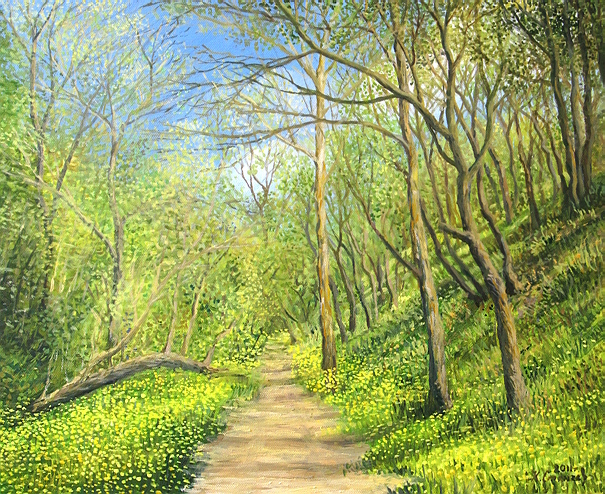 New painting is added to section "Available pictures", canvas named "Impetus". 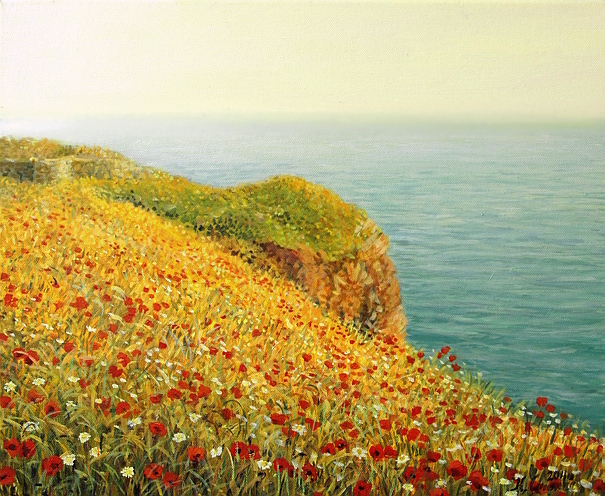 In the month of the year in which almost everybody is going or returning from the sea, I decided to head on to the shore myself, but in front of the canvas. 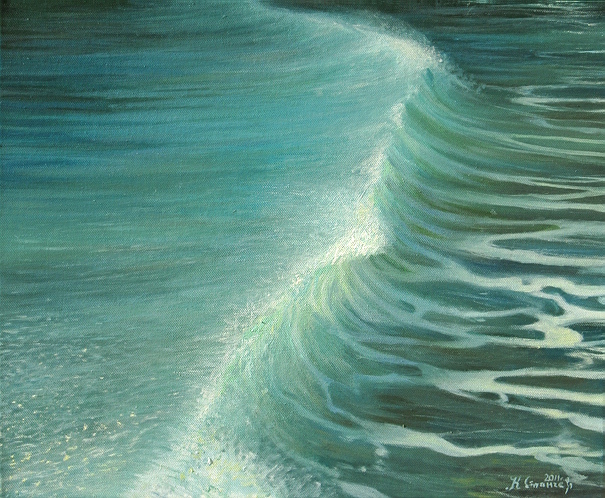 I represented my favorite moment - the one in which the wave stood for a split second beaming in the light of the sun, just moments before spreading along the shore. 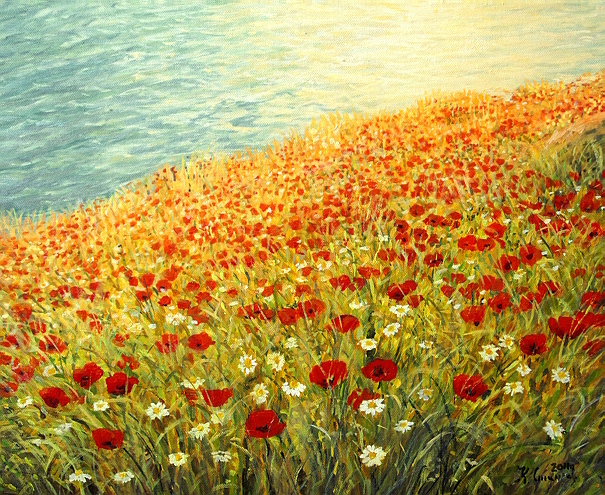 New painting is added to section "Available pictures", canvas named "Sun Nuance". 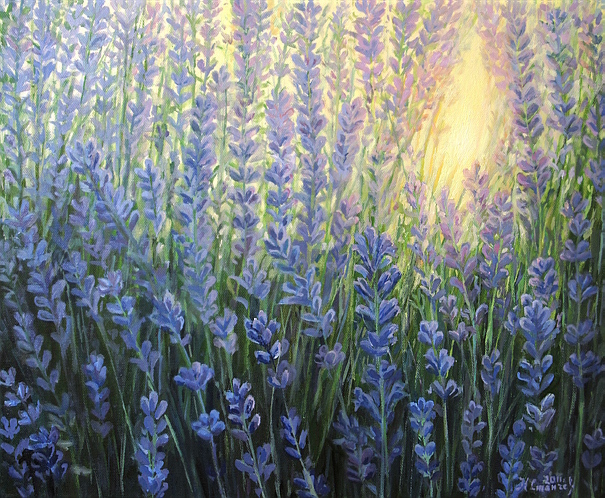 Last rays sunlight, giving a warm nuance to the blossoms of this lavender bush - nice challenge for every painter. Wishing you a beautiful weekend! 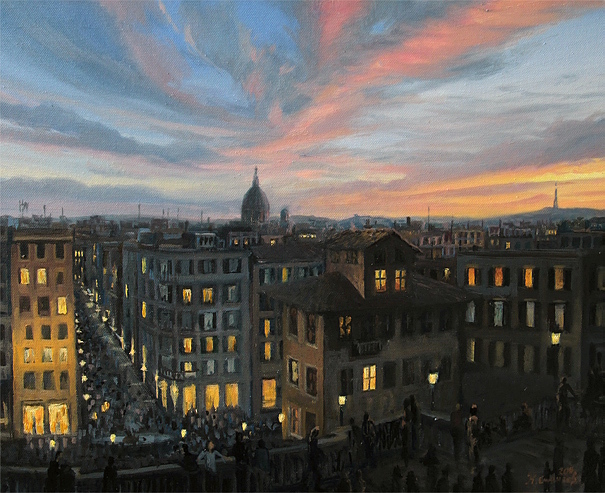 New painting is added to section "Available pictures", canvas named "Rome in The Light of Sunset". The day falls asleep, Rome - no. 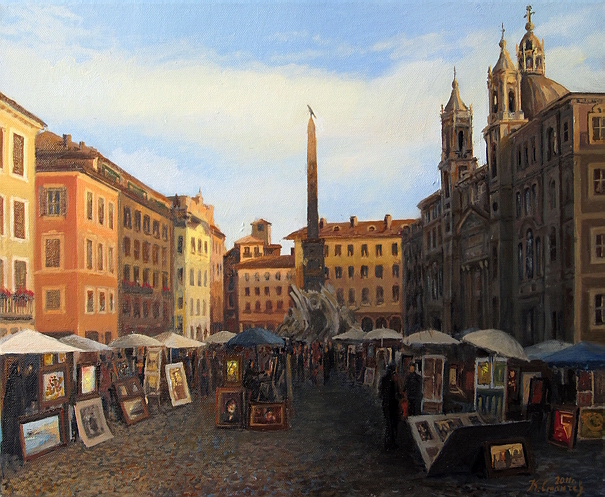 The Italian capital is the first place where crowds of tourists through the streets under the "Spanish Steps" brought to me charm. Over bathed in the light of the sunset town floated an atmosphere of empathy of the moment. Right there, at that moment I decided to recreate my emotions on canvas. Wish you all a sunny and full of harmony weekend. 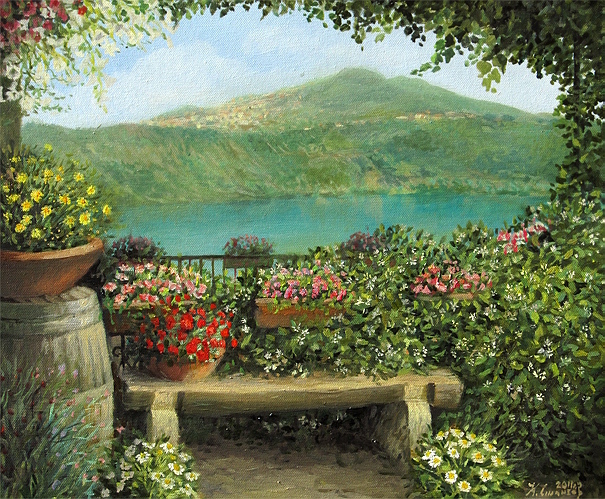 New painting is added to section "Available pictures", canvas named "Castel Gandolfo". The small Italian town with a population of about 8,000 people is spreading on the high bank of volcanic Lake Albano, only about an hour by train from Rome. Walking the narrow streets full of fragrant flowers and the views of the crystal surface of the lake remained sealed forever in my memories. In Castel Gandolfo is the summer residence of the Pope. 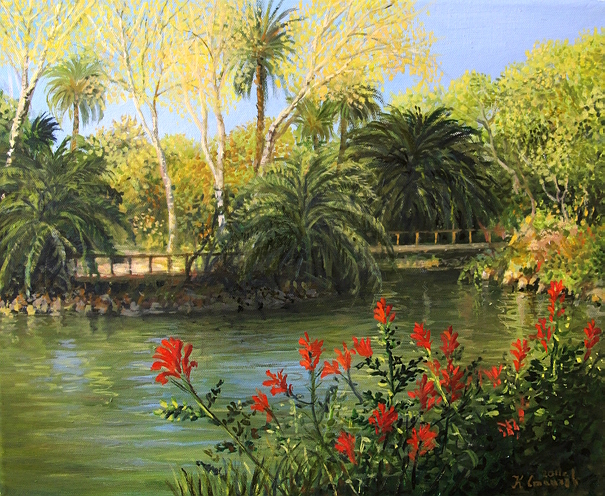 New painting is added to section "Available pictures", canvas named "Garden of Eden". Barcelona is one of my favorite places in Europe, the walk in the "Parc de la Ciutadella" reminded me again why I love this city so much. Serenity in the park in the soft morning sunlight, reflections playing on the surface of the lake and the parrots flying in the air, giving me a sense of unreality and a fairytale landscape. 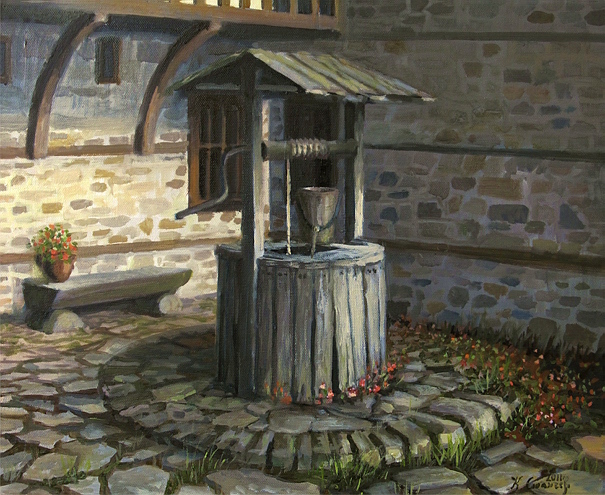 New painting is added to section "Available pictures", canvas named "Fountain of Life". I always loved the wells, but with this one found in the yard of the Agushevi Konatsi, I fell in love. Although old, with dried off boards by the years past, with noble patina on the handle and moss on the tiles, its still standing proud and still gives life with generousity. Magic of Rhodope Mountains, nestled in a courtyard. Wishing fresh and vibrant week to all friends of kirilart.com. 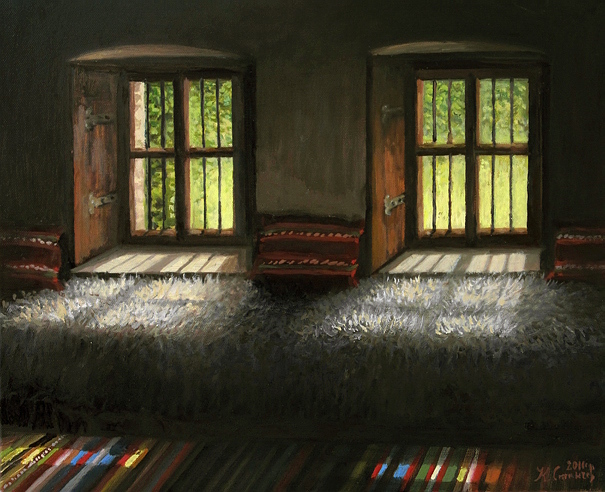 New painting is added to section "Available pictures", canvas named "Window To The Past". When I crossed the threshold of the Velyanov's house in Bansko, was as if caught in a time machine - I watched through the windows to the garden and I was convinced that any moment I'll hear the sound of horse hooves on the street and folk noise from past times. Simple interior preserved in it's authentic look, influenced me very deep. I decided to paint this place on the canvas at the right time and today I'm presenting to you the finished painting. New painting is added to section "Available pictures", canvas named "Yelow Scent". Sometimes even a place I have visited dozens of times, is managing to show a breathtaking beauty. In such moments I'm going straight back to the canvas to start working - the moment has to be represented as a painting while it's still alive and vibrant in my mind. 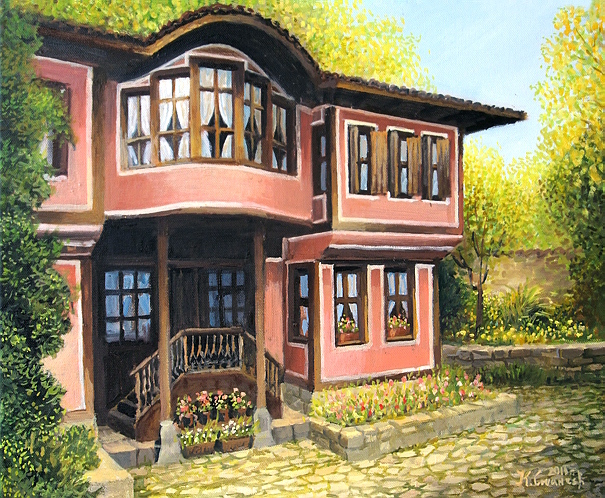 New painting is added to section "Available pictures", canvas named "Kableshkov's House". Today I present recreated on the canvas, one of the most beautiful houses in Koprivshtica - the house-museum of Todor Kableshkov. 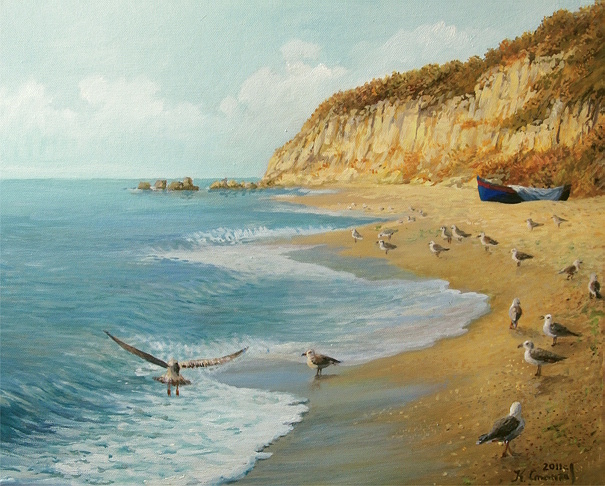 New painting is added to section "Available pictures", canvas named "The Beach". One of my favorite places to walk near Varna, especially when the cheerful crowds of tourists subsides at the end of the season. The beach then becomes a realm of tranquility, a place for contemplation and charge with positive energy. 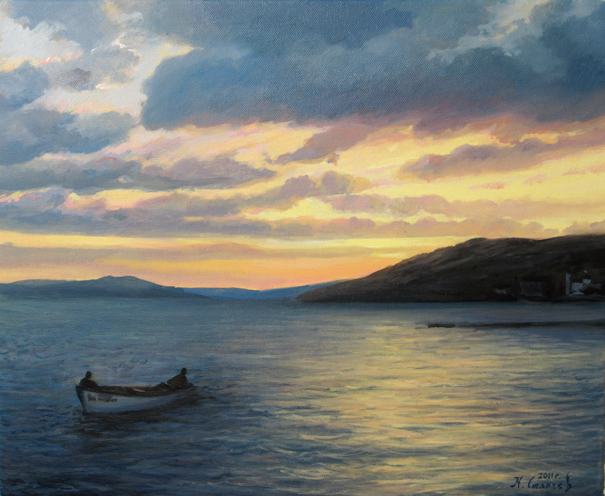 New painting is added to section "Available pictures", canvas named "After Fishing". Balchik is one of my favorite places to walk along the northern coast of Black Sea. Today I'm presenting fishermen going back to Balchik's port at the very end of a long the day in the sea - Subject full of peace and harmony. 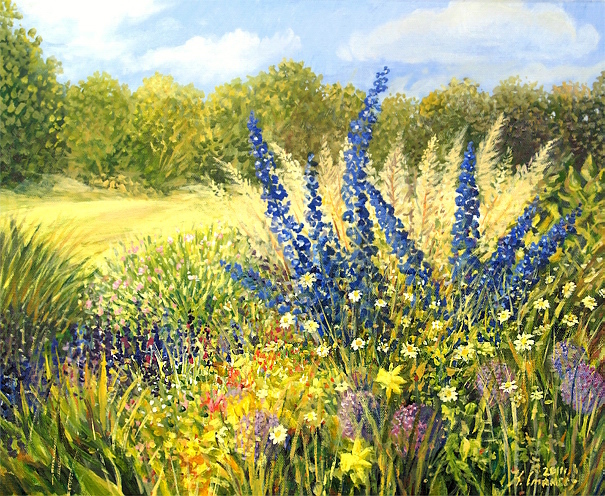 New painting is added to section "Private Possession", canvas named "Delphinium". Happy Holidays to all Christians, flowers, bushes and trees that today celebrate their Names day. Be healthy and happy! 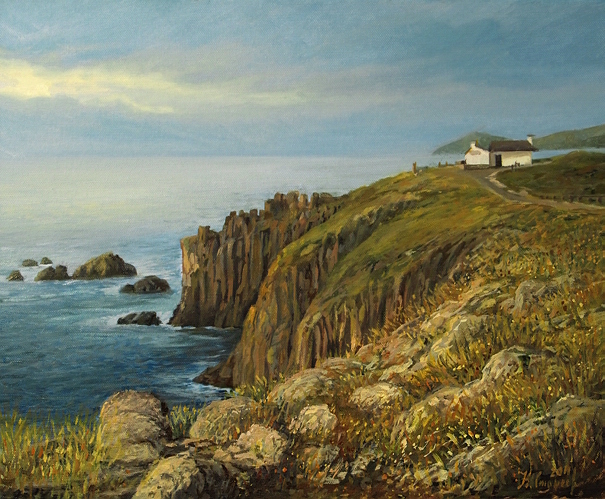 New painting is added to section "Available pictures", canvas named "Land's End". "Land's End" - a place at the end of the earth, where you will leave a small piece of yourself, a place which will remain forever as a part of you. 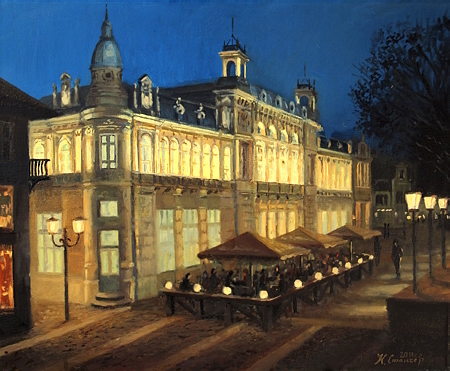 New painting is added to section "Available pictures", canvas named "The Profitable House in Russe". This building is one of the most important architectural monuments not only in the city but also in Bulgaria. I love my hometown and even from a distance, I'm following what is happening in the city. I sincerely hope Russe will manage to preserve in these difficult times its European spirit and culture.